Behind every great innovation is a great insight. Increasingly, 21st century insight and innovation are powered by data. As data science matures past its infancy, it’s become an elemental part of every industry from sports and retail to health and finance. Data is basically the new oil. It’s a precious resource essential to modern society’s advancement. Over the last few years, data has powered incredible developments across a range of disciplines. 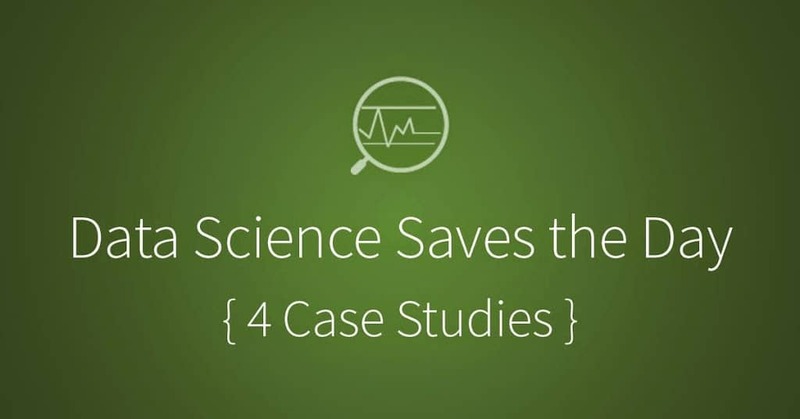 Let’s look at four specific times data science solved game-changing problems. The 2012 UCI Road World Championships took place in the southernmost region of the Dutch province of Limburg. The incredibly intense pressure of competing on the world stage was tempered slightly by the fact that the start and finish for each of the cycling events—individual time trials, 129 km road races, 267 km road races and, for the first time since 1994, a team time trial—was in pastoral Vilt, a lush hamlet in Limburg with gently rolling hills and half-timbered houses. Despite the tranquil setting, the tension was acute. And when it came time to deliver, the U.S. women’s cycling team tanked. In the time trial, the U.S. team ended up a full five seconds away from even being considered for a medal. In any Olympic sport, five seconds is like an eternity—not least in cycling, where professional cyclists ride up to 30 miles per hour. Enter: Sky Christopherson, a veteran cyclist on the U.S. Olympic men’s team and holder of the cycling world record. How had Christopherson broken that record, handily oustripping the previous holder’s time? Not through performance enhancing drugs, or 10,000 hours of rote practice, or the world’s most elite trainer. Through data science. Once on board as a leader of Team USA’s training crew, Christopherson tapped into Datameer, a data visualization tool that translates raw data into easily digestible tables, graphs, charts, diagrams, maps, and tag clouds. Rendered collectively as a dashboard or an infographic, the data tells a coherent story. With Christopherson at the helm of their data-driven training, the women’s cycling team was able to combine all the mathematical insights they were collecting from their wristwatches, heart monitors, and other wearable tech in one place and then analyze that data to optimize adjustments to their routines, behavior, and lifestyle based on data patterns. For example, data insights revealed how room temperature and sun exposure affected the athletes’ deep sleep, which is essential to the release of human growth hormone. As a result, when the team got to London’s overcast Olympic village for the 2012 Olympics, they used light box therapy and adjusted temperatures in their rooms to ensure that their sleep cycles were on point. Together, the team’s data insights added up to the difference between winning and losing. Team USA went from a five-second deficit that kept them from even being considered for a medal to clinching the silver medal at the 2012 London Olympics. The invigorating aroma of roasted coffee beans. The rich, sweet denseness of a warm glazed donut. These are the ingredients of the workday mornings of hundreds of thousands of Americans. The problem is, coffee and donuts can be found at an increasingly vast number of places, from mom-and-pops to global bastions of industry. The battle for consumer market-share in the breakfast fast food category is fiercer than ever. So one might ask, does America actually run on Dunkin’? The $9 billion Dunkin’ Brands (parent company of Dunkin’ Donuts and Baskin-Robbins) certainly wants to keep it that way. But as competition ramps up, as the landscape of eating out in the U.S. skews towards healthier options and more considered food choices, and as food commodity prices continue to climb, retaining a foothold in the fast food business has become more and more of a challenge. To wit, Dunkin’ Brands delivered disappointing results in its Q3 earnings report. Comparable store sales of the Dunkin’ Donuts U.S. segment increased just 2%, and revenue growth was below expectation, rising just 3.4% year-over-year. So the fat content in Dunkin’ Donuts’ blueberry muffin wasn’t the only thing that had been reduced in recent years; so had the brand’s rate of revenue growth. Until now. Dunkin’s got a slam-dunk President of Global Marketing and Innovation in John Costello, whose resume is fit to burst with impressive titles like Executive Vice President of Merchandising and Marketing at The Home Depot, Senior Executive Vice President of Sears, Chief Global Marketing Officer of Yahoo!, and President and COO of Nielsen Marketing Research U.S. Under Costello’s leadership, Dunkin’ Donuts has turned to data to strengthen its footing in the fast food space. This past January, Dunkin’ launched its first-ever loyalty program, DD Perks® Rewards, built specifically to harvest data on customer habits. The program lets the company utilize that data to target people with individualized offers based on insights gleaned from their interactions with the brand. In order to understand the data and act on it, the brand’s vast marketing team has coupled the raw numbers with deep interviews with customer groups, plus input from the company’s 17,000 franchisees. The result? Shares are up and transactions have increased, thanks to the data-driven customized marketing. As of this month, DD Perks® has accrued two million members and the accompanying Dunkin’ Mobile® App has surpassed more than 10 million downloads. Dunkin’ Donuts will be celebrating its 65th birthday next year. Thanks to data science, it can toast in comfort to another 65 years, at least. Healthcare offers some of the most exciting potential for data science. Data insights can bolster athletic performance and increase donut sales, sure; but it can also save lives. One of the biggest challenges physicians face in modern medicine is making sure their patients adhere to the prescribed medication schedules. A doctor can identify and diagnose a condition, prescribe medication, and convey those conclusions and solutions to a patient. But once the patient leaves the examination room, it’s up to him or her to actually act on the doctor’s advice. The right dosage, at the right time, and regularity throughout the week are all essential elements to ensure successful medicinal treatment. But what’s a medical practitioner to do to enforce a medication schedule once a patient exits the facility? In short, turn to data. Symphony Analytics harnesses Big Data to integrate predictive analytics into key business processes. In a healthcare setting, that means managing mountains of data from a huge span of sources—hospitals, physicians, pharmacies, and patients—and mining it all for actionable insights. These data insights are critical not only to the progress and survival of medical operators, but to the progress and survival of patients as well. Last year, Symphony Analytics undertook a deep dive into the data behind adherence to medication schedules in order to take a stab at greatly improving the issue. The company’s Symphony Health arm has invested tens of millions to create a comprehensive medical database, which integrates data across the four dimensions of healthcare: patient, provider, payer, and prescriber. Tapping into that profound data pool (obtained with permission from patients) to identify the attributes of patients with the highest and lowest adherence, in addition to the physicians treating those patients, Symphony was able to develop strong predictive models to help plan an appropriately tailored medication schedule for different patient populations. Imagine the long-term effects of a study like this. If these insights were applied to every hospital across the globe, hundreds of thousands of patients could recover faster, more completely, and at lower cost. When it comes to medicine, data science has dramatic potential. Finance is a fitting arena with which to round out our four examples of when data science saved the day. The financial industry generates petabytes of data just by shifting in its seat. Think about it: a sector that’s built on numbers naturally makes for rich ground for data science. Banks are learning to master the art of data analytics in order to improve customer engagement, revamp products, optimize marketing outreach, reduce costs, and manage risk. One aspect of finance in which data has recently flexed its muscles is credit. With Big Data, the finance industry can aggregate more robust information about consumers. Data’s the new black. And we’re all on-trend. In the current financial landscape, the traditional FICO score—a reflection of payment history, amounts owed, length of credit history, new credit, and types of credit used—is very limiting in terms of gauging the full scope of a potential creditor’s reliability. No wonder: the FICO score came about in the 1950s and hasn’t been updated since. Without a good FICO score, a customer may not be approved for a home loan, could get hit with a super-high insurance premium, and probably have to pay higher interest fees on their credit card. Because of the limited scope of the variables FICO uses to calculate a credit score, many people don’t qualify for loans despite the fact that they’d be worthy. But in 2014, consumers can generate more data than ever before at any other time in the history of the world. The consumer picture is more complex than ever. Shouldn’t loan eligibility be determined through more than just FICO’s handful of categories? Startup ZestFinance thinks so. The company, helmed by former Google CIO Douglas Merrill, uses Big Data analytics to aggregate consumer signals that give a more robust prediction of credit worthiness than the traditional FICO system. Thanks to ZestFinance’s data models, lenders can better understand which customers are going to pay back, and people who otherwise wouldn’t qualify for a loan are able to qualify. Likewise, collection companies can focus their efforts on establishing individualized payment plans, rather than harassing borrowers carte blanche. With a team of top data scientists from Google and lending experts from Capital One, ZestFinance analyzes thousands of potential credit variables to better assess factors like the potential for fraud, the risk of default, and the viability of a long-term customer relationship. It’s a win-win: borrowers get increased credit availability, and lenders get higher repayment rates. Data science has the powerful ability to transform the way athletes train, companies market their products, physicians prescribe medication, and credit lenders underwrite loans. The most powerful part of all? Things are only getting started. Data science is still a nascent field. Careers in the sector have only recently started to crystallize, and the potential of data insights to rock the world has only just begun to come to light. Amazing! An article about data science big wins with 0 data to back it up! !